The peak of summer heat has arrived in Fort Collins, and the professionals at Advanced Landscaping & Sprinklers, Inc. have been busy helping our commercial and residential customers maintain a healthy lawn. While it’s always best to hire a professional landscaping company for your landscape maintenance needs, there are a few tips you can follow to help your lawn combat the extreme heat of summer. In part one of this series, we will go over the first four tips and tricks to maintaining a healthy lawn this summer. 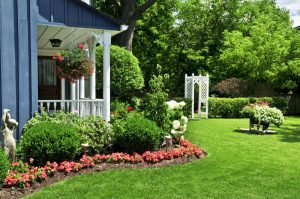 One of the most common mistakes made by both homeowners and unqualified landscaping companies, is cutting the lawn too short. By cutting your grass too short, it can actually reduce the plant’s’ ability to properly produce energy and stunt its growth. By cutting your grass at the proper height, your lawn will develop stronger roots, and become more tolerant to outside stressors. It’s important to keep in mind that no grass grows the same, and different varieties of grass will have different growth habits and appropriate mowing heights. If you’re unsure of the appropriate length to cut your grass, hire a professional landscaping company to mow your lawn. If you’re unsure of the type of grass in your lawn, always remember the “one-third” rule, and never cut more than one-third of the grass height at one time. This will allow your lawn to stay cool during the hot summer months, because less plant tissue is being removed. Many homeowners overwater their lawns during the summer, under the misconception that extreme heat requires excessive watering. If the soil in your yard is constantly wet, it can create a number of negative physiological problems for your grass, plants and other soil organisms. If your grass is overwatered, its roots will constantly be deprived of the oxygen it needs to thrive, and may become even more susceptible to diseases. If you’re not sure how frequently to mow your lawn, or are planning on going out of town for several days, call a professional landscaping company today. While maintaining your lawn mower’s’ blades might seem like a pain, it has extreme benefits on your lawn’s health. Plants have been found to heal faster when they are cut with a sharp blade, and dull blades are more likely to tear plant tissue, not just cut it. Torn grass tissue will develop an unattractive brown appearance, and may be more prone to outside stressors and disease. By using a sharp blade, you can rest assured the health of your grass is out of harm’s way.